November: the month of sweet potatoes, sweaters, turkeys and also 30 blog posts. Now I'm sure you're thinking, "Um, what did you say there? 30 blog posts!" I'm still thinking the same thing myself really. A blog post per day every day of November is a bit, well, ambitious compared to my haphazard past schedule. However, seeing as how I'm always up for a good challenge, when Holly Spangler from Prairie Farmer put out the invitation to join her "30 Days, an agricultural blogging challenge," I hastily jumped aboard... Then I jumped back off, then on, then off, then on until I finally decided I was committed to this thing. Now we are here on October 31 and for the next 30 days, I'm supposed to write a blog post. Every. Single. Day. I might be crazy. 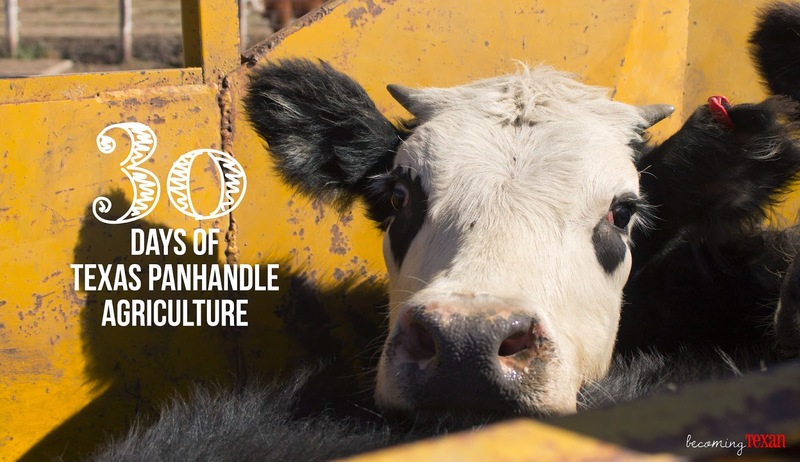 Despite my anxiety about this, I know I've chosen a perfect topic capable of providing at least 30 days of quality content: 30 Days of Texas Panhandle Agriculture. It is the perfect topic for me as I'm still learning about the Panhandle myself. Why not take y'all along for the ride? Be prepared for a variety of posts, from farmer and crop profiles to cotton stripping demos (Ha! Strippers!). I'll try to find some flashback-worthy topics as well. I'd love for you to read along with me as I take on this challenge since I need you to keep me accountable. I'd also love to hear any questions or ideas you have about agriculture in the Texas Panhandle! Here's to a great 30 day adventure! Update: Like I mentioned above, I'm one of many agricultural bloggers doing the #30Days Challenge. Check out the master list of participants here. There is a little bit of everything from 30 Days of Dairy to 30 Days of Dirt Roads so I'm sure you'll find something to suit your fancy!